The latest set of statistics for female genital mutilation in England has been released and demonstrates once again that state institutions make a pretty poor job of collecting numbers, and that they bend over backwards to ignore the elephant on the prayer mat. British men and women rightly recoil from this barbarous and repulsive practice, with dissent coming only from those who mistakenly argue in favour of cultural and moral equivalence as well as some whose alien culture embraces this and other forms of barbarism. Be that as it may, practising FGM has been illegal in the UK since 1985 and since 2003 it has been illegal for girls to travel from the UK to undergo FGM abroad. In that sense, one’s personal repugnance is secondary and the law takes over. Those responsible for its enforcement ought to track down the law-breakers and punish the criminals. However, in the thirty-three years since FGM was made illegal there have been only three or four prosecutions, and none was successful. The new numbers tell us that in the three years from July 2015 to June of this year there were 15,755 newly recorded cases in England, a number which obviously relates only to women and girls who have had contact with NHS England for conditions in which FGM would come to light. What the overall figure might be is anyone’s guess. The official figures for the most recent quarter (April to June 2018) are revealing. 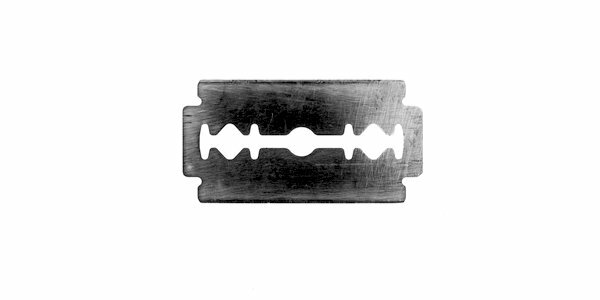 There were 1,675 individual women and girls ‘who had an attendance where FGM was identified or a procedure related to FGM was undertaken in the period’. NHS personnel are meant to log a few details including the country of birth of the individuals, and this can be represented in a graphic to highlight two points. First of all if the country of birth is a required field then it is remarkable that in almost half of the women who attended, the country of birth was not recorded or, extraordinarily, not known or not stated. Was the return for this period untypical? Comparable figures for two quarters in 2017 show near-identical proportions of individuals of unknown provenance where between 45 and 50 per cent of the total were of uncertain or unknown origin. It is not too far-fetched to conclude that some of the NHS sources simply fail to provide the information required for whatever reason. Looking at the data broken down region by region, it is clear that London is consistently in the lead when it comes to ignoring the requirement to establish and record the individual’s country of birth. Could it be that the NHS is providing treatment to women from overseas who are unable to speak English and who are not entitled to it? Are NHS workers being idle in completing their paperwork or are they altruistically treating foreigners free of charge while taxpayers shovel ever more exorbitant mountains of money into the insatiable maw of the Health Service? The conclusion from all this is that if the NHS wants a complete and accurate data set in respect of FGM, then it needs to get tough with its recalcitrant respondents and not allow its questionnaires to be routinely sidestepped. The second point is that where the country of birth is recorded and grouped regionally, there is an unstated correlation which is self-evident and which need not be laboured here. East Africa accounts for half of the individuals whose country of birth has been noted. Those readers who learned geography at school in the days before geography meant describing the bus routes in their home town will have an inkling about which countries in the region are likely to have contributed to the 455 individuals from East Africa included in the latest numbers. East, West and North Africa are in that order the largest sources of FGM women to be treated by the NHS followed by those born in the Orwellian-sounding region of ‘West Asia’, which may surprisingly correspond to an area richly endowed with hotbeds of peace. Could ‘West Asia’ stand for the Middle East and how far east does ‘West Asia’ in fact stretch? The statistical muddying of the waters by the NHS with ambiguous categories only promotes further cynicism at home among a population increasingly exasperated with Rotherhams, Manchester Arenas and ‘diversity bollards’ popping up like mushrooms around British cities. 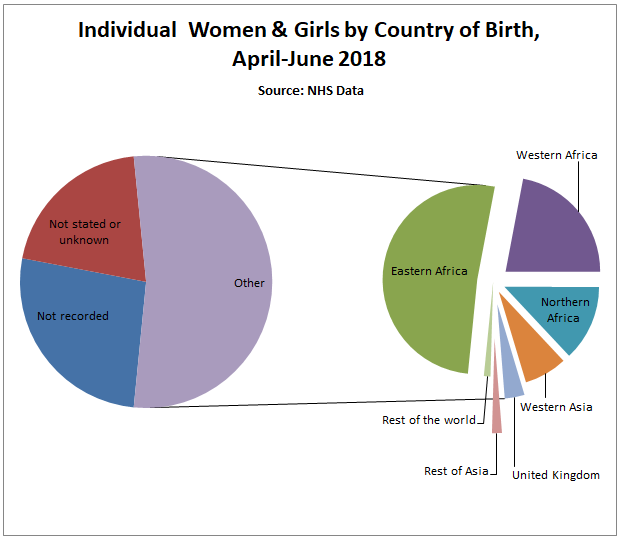 Perhaps the most shocking statistic in all of this is the vanishingly small (as some might see it) segment of British-born women and girls caught up in the April to June 2018 figures. FMG has been illegal in the UK since 1985 and yet twenty-five UK-born individuals from London and the Midlands have shown up in the statistics for that quarter year. FGM is a crime. The NHS should report suspicions of crime to the police and the police should spend less time endorsing anti-bigotry campaigns and putting on lippy, and more time following up on crimes whose prosecutions and convictions fall woefully short of addressing the problem: an average of more than five thousand FMG victims per year, a handful of trials and no convictions. Government needs to take control and Sajid Javid might be the Home Secretary to do it. Britain’s indigenous people and those who have immigrated and integrated here have shared cultural values which are superior and which deserve to be defended. Much of the relative prosperity and freedom of British citizens in the UK derives from this advantage. A poor recording of FGM data is a tacit acceptance of FGM. A failure by police to follow up on the crimes committed against the many victims of FGM is wholly unacceptable.